Teladoc Health recently announced that it entered into an agreement to acquire a European telemedicine provider and that it had plans to expand into Canada. The stock is not cheap, but I do not believe that Teladoc's growth prospects are fully baked into the price. I am long Teladoc Health, and I plan to stay long the stock. 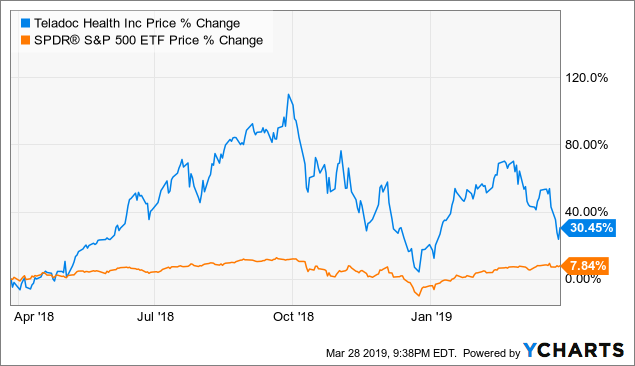 Teladoc Health's (NYSE:TDOC) stock has underperformed the broader market so far in 2019, but shares have significantly outperformed the S&P 500 (SPY) over the last year. There are plenty of reasons to like Teladoc in today's environment - read this latest article for my thoughts on the company's bull case - but I believe that the recent announcements related to management's expansion plans should get investors even more excited about what the future may hold for this growing, disruptive company. On March 19, 2019, Teladoc agreed to acquire MedecinDirect, a Paris-based telemedicine service provider. The acquisition not only expands Teladoc's global reach, but it also brings several valuable virtual care services into the fold. MedecinDirect is a market leader (partnerships with 40 of the leading insurance companies and almost 50% of the top 30 private medical insurers) with a well-established management team. Teladoc will have operations in the U.K., Australia, Canada (more on this below), Spain, Portugal, Hungary, China, Chile and Brazil so France will soon be added to a growing list. This acquisition is expected to help fuel Teladoc's global reach, which is a key driver to management's long-term strategy. The news only got better when Teladoc announced that it launched telemedicine services in Canada, which will be the first company to offer these types of services in the country. The MedecinDirect and Canada expansion news shows that management is serious about expanding services outside of the U.S. Yes, it is not a foregone conclusion that Teladoc will be successful with its international investments but, to me, this management team is taking steps in the right direction. It is entirely too early to determine what the recent acquisitions will mean for Teladoc's results over the next 12 months, but I do believe that the news is meaningful if you consider the company's long-term growth strategy. In late-February 2018, Teladoc reported a Q4 2018 loss per share of $0.35 (beat by $0.01) on revenue of $122.7M (beat by $2.7M), which also compares favorably to the year-ago quarter. It was not Teladoc's results that caused the stock to drop by an almost double-digit figure, but instead it was management's forward guidance that was not well received by the market. 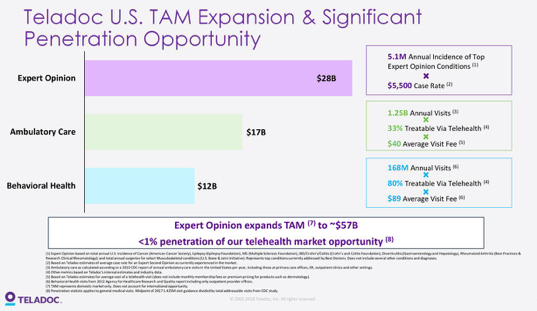 The Street was looking for adjusted EBITDA to be $42M (significantly higher than the guidance of $25M-$35M), but in my opinion, there is a lot to like about how Teladoc is positioned for 2019 and beyond. The expansion news covered above has the potential to be a growth driver, but let us also not forget that this company still has a significant market opportunity that is expanding by the day. Additionally, there is another potential catalyst that could materialize in 2019. The Motley Fool recently floated the idea of the newly created Berkshire Hathaway (BRK.A) (BRK.B), JPMorgan (JPM) and Amazon (AMZN) healthcare joint venture, Haven, teaming up with Teladoc Health and, in my opinion, this rumor makes a ton of sense. Not only would a Teladoc-Haven tie-up allow for the newly created entity to expand its reach in short order, but I believe that it would also create an opportunity to cut out unnecessary costs, which is a key strategic goal for Haven's management team. Additionally, it is early, and this is complete speculation, but in my mind, an outright acquisition of Teladoc would put Haven in a great position to achieve the main goal of being a truly distributive company in the healthcare industry. After the recent pullback, Teladoc's stock is trading at reasonable levels based on its own historical metrics. The stock is not cheap by any means, but I also do not believe that the potential growth is fully baked into the stock price either. Investing in small-cap companies comes with many risks, but the major risk for Teladoc is related to the company being outspent by larger competitors. Additionally, the company relies heavily on its partnerships to expand its business, so deteriorating relationships in the industry could have a material impact on Teladoc's business. In addition, integration risk needs to be considered given the numerous acquisitions that have been made over the last few years. And most importantly, regulatory changes have the potential to greatly impact Teladoc's business. Please also refer to the 2018 10-K for additional risk factors that should be considered before investing in the company. Additionally, as described here, the COO/CFO departure definitely adds risk to the story. And finally, some pundits have raised concerns about management using non-GAAP metrics, as outlined in a recent Forbes article, but I do not believe that this is a significant risk factor. I would, however, monitor this recent development because it has the potential to eventually turn into something more serious that may warrant attention. In my mind, Teladoc Health will either grow into a significantly disruptive company in the healthcare industry or it will get acquired by a larger player. Either way, it is a win-win situation for investors. 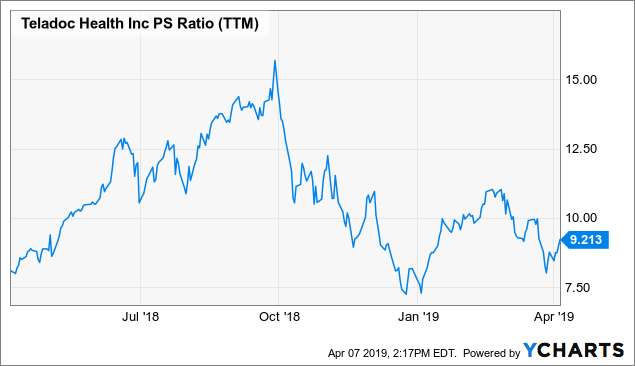 Moreover, I believe that the recent expansion news will speed up Teladoc's growth, which should help propel the stock price higher in 2019. TDOC's shares will likely not go up in a straight line, but in my opinion, the risk is to the upside if you are in it for the long haul. Disclosure: I am/we are long TDOC. I wrote this article myself, and it expresses my own opinions. I am not receiving compensation for it (other than from Seeking Alpha). I have no business relationship with any company whose stock is mentioned in this article. Additional disclosure: Disclaimer: This article is not a recommendation to buy or sell any stock mentioned. These are only my personal opinions. Every investor must do his/her own due diligence before making any investment decision.